In the 1950s and 1960s, Seymour Benzer conducted a series of experiments to examine the structure of a gene. Because no molecular techniques were available at the time for directly examining nucleotide sequences, Benzer was forced to infer gene structure from analyses of mutations and their effects. The results of his studies showed that different mutational sites within a single gene could be mapped (intragenic mapping) by using techniques similar to those just described. Different sites within a single gene are very close together; so recombination between them takes place at a very low frequency. Because large numbers of progeny are required to detect these recombination events, Benzer used the bacteriophage T4, which reproduces rapidly and produces large numbers of progeny. grown on a lawn of E. coli bacteria. Certain mutants, called r for rapid lysis, produce larger plaques with sharply defined edges. Benzer isolated phages with a number of different r mutations, concentrating on one particular subgroup called rll mutants. Wild-type T4 phages produce typical plaques ( Figure 8.30) on E. coli strains B and K. In contrast, the rll mutants produce r plaques on strain B and do not form plaques at all on strain K. Benzer recognized the r mutants by their distinctive plaques when grown on E. coli B. He then collected lysate from these plaques and used it to infect E. coli K. Phages that did not produce plaques on E. coli K were defined as the rll type. Question: How can rII phage mutants be mapped and what can they reveal about the structure of the gene? Only the a+ recombinant can grow on E. coli K, allowing them to be identified. Conclusion: Mapping more than 2400 rII mutants provided information about the internal structure of a gene at the base-pair level—the first view of the molecular structure of a gene. The frequencies of recombinants were used to map rII mutants. Each box represents one DNA base pair. Mutations were found at each location shown in red. 8.31 Benzer developed a procedure for mapping rII mutants. Two different rII mutants (a- b+ and a+ b-) are isolated on E. coli B cells. Neither will grow on E. coli K cells. 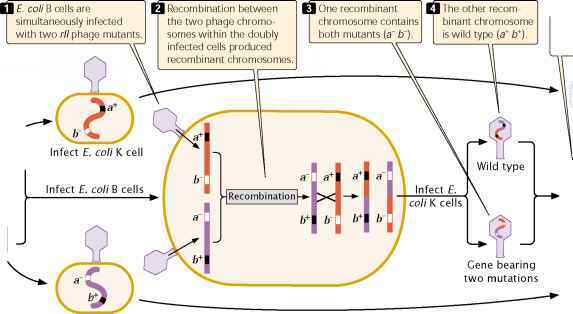 Only the a+ b+ recombinant can grow on E. coli K, allowing these recombinants to be identified. rIIA and rIIB refer to different parts of the gene. into progeny phages (Figure 8.31, steps 3 and 4), which were then used to infect E. coli K cells. The resulting plaques were examined to determine the genotype of the infecting phage.